This 3-out, 2-in motion offense was important in our success over recent years, which included several trips to the state tournament (boys and girls). You can name this offense after your school mascot... for example, if your school's mascot is "Eagles", call it your "Eagle offense". We called it our "Rayder" offense. Use this offense if you have two good, solid inside post players. We will "tweak" this basic offense from season to season with special plays for our better scorers. If we have a strong shooting guard O2, we will use some of the 2-series plays... or a gifted point guard, we go to the 1-series for a play or two. If the play falls apart, we just fall back into this basic motion offense. See "Motion Offense" for basic motion principles. Perimeter players should catch the ball in triple-threat position, and then (1) look to shoot, (2) look into the post, and (3) look to jab-step or shot-fake and dribble-penetrate. This is very important, as too often, especially early in the season, players will simply catch the pass and start dribbling. After receiving the pass, read the defender. If the defender is sagging off, hit the outside shot. If the defender is up tight, attack with a dribble move. If the defender is flying out at you, shot-fake and dribble around for a mid-range jump-shot (or a take to the hoop). On dribble-penetration, make the correct decision. Sometimes our guards will make a nice move around the defender, but then take it all the way up the middle of the paint to the hoop, where he/she is met by a tall defender (or two) and either gets the shot blocked or turns it over in traffic. Instead (especially vs a 2-3 zone), dribble-penetrate and pull-up with a jump-stop just inside the lane, low arc area and take the short jump shot in the lane... a high-percentage shot with our rebounders in place down low. Guards must learn when to go to the hoop, when to pull-up, or when to pass to a post player inside, or when to kick a pass out to the opposite wing or corner. Tips on passing into the low post... the wing player with the ball should read the post defender. If the post defender is playing behind our post player, we just pass it in. If the defender is fronting from the top, then curl-bounce pass from the base-line side. If the defender is fronting from the base-line side then make one dribble toward the top and feed from the top. If the defender is full-fronting, don't force the pass... pass back out on top, or to the weak-side post cutting to the ball-side elbow (see diagram PP4) below. After feeding the post, the wing player slides to the corner for the possible pass back out. See these post feed drills for details. Move! Get open! Perimeter players should use v-cuts, back-cuts and screens to get open. Don't stand still! Screen for each other. Pass and cut (diagram B). Pass and screen-away (diagram C). Fill the open spots on the perimeter. Maintain good spacing at all times and keep the defense spread out. An outside player can make a cut inside, but should not stay inside and clog things up for other players. For example, (diagram B) if O1 cuts inside through the paint and does not receive the ball, he/she should immediately cut out to the opposite corner and wing, while that wing player O3 moves out to fill the spot at the point. "Dribble-at" rule: If a teammate is dribbling at you, back-cut through and out to the opposite side (diagram D). The exception is if we are running a weave-screen ("WS") play, which is a called play. Point to wing pass denial: If O1 is having difficulty passing to the wing (good deny defense on the wings), O1 can simply dribble the ball to the wing. Following our "dribble-at" rule, the wing back-cuts through to the opposite side, as the opposite wing fills the top spot. For example, (diagram D) if O1 dribbles toward the wing O2, O2 back-cuts underneath along the baseline and fills the O3 spot while O3 rotates out to the point. Other things that we can do when the wing pass is being denied are simply run (1) a weave-screen play, (2) a "zipper" cut (below) or a (3) "Hammer" play (below). O1 is our "safety" and has "back" responsibility when the shot is taken and must prevent the fast break. If O1 dribble-penetrates, then the wing player on the opposite side away from the penetration moves out and becomes the safety. Post players work together, screening for each other and reading what each other is doing. Whenever a post player gets the ball inside in a 1-on-1 situation, the opposite post should slide up to the weak-side elbow. We want to give our post player with the ball more spacing so he/she can score (or get fouled). If the low post is fronted and denied, the opposite post flashes to the ballside elbow for the pass. Now we can often go "hi-lo" to the low post, who seals his/her defender for inside position. Our high post player could also take this shot or make a dribble move around the defender to the hoop (to the open side of the lane). When the ball is on the wing, the ballside post player should fight for position in the low post. If he/she can't get open within a count of two, he/she should screen away for the opposite low post player (who then comes to the ball-side low post looking for the pass). If the cutter is not open, he/she moves out to the short corner, as the screener seals and looks for the pass from the wing. Base-line dribble penetration. (Diagrams E and F) If the ball is on the wing and the wing player makes a dribble-move to the base-line, the ball-side post player should "slide-up", or "I-cut", to the ball-side elbow, not only to clear out for the wing, but also for a possible dump pass to the elbow for a shot. Dribble-penetration from the top. (Diagram G) If the ball is on the wing and the wing player makes a dribble move into the top seam, the ball-side post player should slide to the short corner, again for spacing, and also a possible pass and shot there. Our "first look" after coming up the court is off the break with our point guard O1 looking to "take the seam" with a 1-on-1 dribble move up the right lane line to the hoop (diagram H)... much like in the dribble-drive motion offense. Our secondary break (diagram H) starts as 4-out with O2 deep in the right corner, O5 opposite low block, O4 at the top (3-point arc) left lane line extended, and O3 (our inbounds passer) is trailing to the left side. O1 looks at the seam to see if he/she can make a dribble-move up the right lane line. O4 has to read O1 and give O1 a chance to take that open seam up the right side of the lane. If O4 cuts too soon, there will be no open lane for O1 to penetrate. If O1 pulls up, then O4 makes the "4-cut" (diagram I), cutting through looking for a pass from O1, and ends up in the right low block, and we are now in our 3-2 set. Also notice in diagram H, that once O3 fills the left wing-corner area, we are initially 4-out. This is a good time to run one of our "Big" plays, a hi-lo play involving O4 and O5 (diagram J). This is a good way to run the offense if you have a talented wing player (O2 or O3). After the 4-cut, we start with O1 passing to either wing, and then shallow cutting thru to the ball-side corner (diagram K). In diagram L, the opposite post player (O5) flashes to the top or ball-side elbow looking for the pass from the wing. If O5 gets the pass, he/she looks inside to O4, or considers a shot there or a dribble move up the opposite side of the lane, or a pass out to the opposite wing O3. You could also have O2 follow his/her pass for a possible hand-off from O5... if no hand-off, O2 goes to the opposite corner-wing, while O3 moves up top. In diagram M, if the top post player O5 does not get the pass, he/she should screen for the wing O2, who makes a dribble-move around the screen for the jump shot or take to the hoop. O4 slides to the short corner. If the X4 defender slides over, bounce pass to O4 inside. If the X3 defender drops inside, kick it out O3 on the wing or corner for a shot there. See the diagrams below. The "Zipper" cut starts with O1 dribbling to the wing, and O2 curl cuts around the low post player and out to the top ("Zipper-2"). "Zipper-3" is same thing, but run to the left side with O3 making the zipper cut. O1 passes to the cutter (O2 or O3) at the top. The "ice" or "iso" cuts (to isolate for the ball) are post cuts where ball-side post player slides to the opposite block, and the weak-side post player slides to the weak-side elbow. This helps create a driving lane for the perimeter player at the top. In the "zipper-ice" sequence, the "Ice" cut does not occur until after the zipper cut is made. The zipper and ice cuts can be called in different sequences. The first two diagrams below demonstrate the "Zipper-Ice" sequence. In diagram N, we are running "zipper" from the break. O4 makes the usual "4-cut", and O2 then makes the zipper cut. In diagram O, we see the "ice-cut", which creates a driving lane for O2. In diagram P, we see the ice-cut after a dribble-handoff, weave-screen ("WS2") play... or "WS2-Ice". Now take a look at "Zipper-3", and the Ice-cut when we run it to the left side... or "Zipper-3 Ice". In diagram Q, O1 dribbles left. O3 makes the zipper cut around O5's screen, and the pass goes to O3 on the top. The direction of the ice cut here depends on whether we have a left-handed O3, or a right-handed O3. For the left-handed O3, we clear out the left side of the lane (diagram R). For a right-handed O3, we clear out the right side of the lane (diagram S). One more option... "Zipper-Ice-Dump" (diagram U), or "Zipper 3-Ice-Dump" (diagram T). After running the Ice cut a few times, we might run the "Ice-Dump" cut. This is the same as the usual Ice-cut, only the post player starts the cut to the opposite block, but then suddenly comes back toward the ball and posts-up there, and we "dump" the ball down into the post player. "Hammer" means both post players will set a double-staggered screen for a perimeter player... O1, O2 or O3, or "Hammer-1", "Hammer-2", and "Hammer-3". We prefer to have O5 as the first screener if possible, and O4 as the second screener. In either case, after screening, O5 will always roll to the hoop, and O4 will pop out to the 3-point arc. "Hammer-1"... (diagram V) O2 and O3 are deep in the corners. O1 dribbles right to set up the screen. O5 and O4 set the double-screen, and O1 dribbles around the screens. After screening, O5 rolls to the hoop, and O4 pops out to the arc (diagram W). O1 could shoot the outside shot or pull-up jumper, or pass to O5 rolling inside, or over to O4. Diagram W also shows a big seam up the left side of the lane that O1 could dribble-penetrate for the lay-up. If the pass goes to O4, we can run a "hi-lo" pass with O4 passing to O5 posting up inside (diagram X). "Hammer-2" and "Hammer-3"... Diagrams Y and AA. O1 dribbles a little to the opposite side to create spacing. O5 and O4 set the double-screen for O2 ("Hammer-2"). O2 cuts over the screens and gets the pass from O1 (diagram Z). Again, O5 rolls to the hoop and O4 pops out to the arc-corner area. O1 can pass to either O2 or O5. O2 can shoot the outside shot, dribble to the hoop, or pass to O5 inside, or O4, O1 or O3 on the arc. At the end of the play, O3 could back-screen for O1. "Hammer-3" is same except to the left side. Again, O2 and O3 start deep in the corners. One other option... at the start of the play, when O5, O4 and O2 (or O3) are on the opposite side, O1 could just make a 1-on-1 dribble move into the opposite seam for the lay-up. Notice in the diagram Y, O1 could just dribble into the left seam, up the left lane line for the lay-up. "Hammer-12"... Diagrams AB and AC. Here we are just looking to hit O2 off a back-cut. O5 and O4 double-screen for O1. O1 starts left and then dribbles around the double-screen. O2 should start a little inside, cut out high to the wing (calling for the ball), and then quickly back-cut to the hoop. O1 passes to O2 if open. If not, O2 moves out opposite. O1 then looks to pass to O5 cutting to the ball-side block. O5 should not cut until O2 has cleared. "Hammer-Special"... Diagrams AD, AE and AF. This play starts with a 1-4 "high stack" set. We use this play just to get O3 involved with a dribble-drive to the hoop. With the 4-across high stack, there may be no low defenders unless X2 (O2's defender) is help-side. O1 passes to O3. O5 and O4 set back-screens for O1. O1 cuts around the back-screens, more of a diversion than anything. O2 drops to the corner. 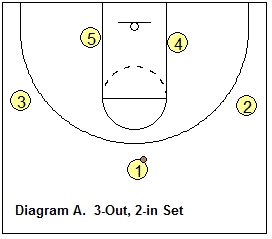 O3 makes a dribble-move to the hoop, looking to score (diagram AE). If the X2 defender is inside in help-side, O3 kicks out to O2 in the corner. After screening, O5 rolls to the right side of the lane and O4 pops outside. If there is nothing there for O3, O3 could pass back out to O4, and then move to the corner. O4 and O5 then can run some "hi-lo" action with O5 posting up inside (like "Big"). In addition to the basic offense above, we will add the weave-screen plays, Kentucky plays, and perhaps some of the plays from the 2-series and the 1-series.